Small leather wallet with wrap-around suede strap. Dark brown rectangular bi-fold wallet opens to reveal cloth-lined flap on right, accordion-fold compartment on left. Made by J.O. Jennings of San Francisco. 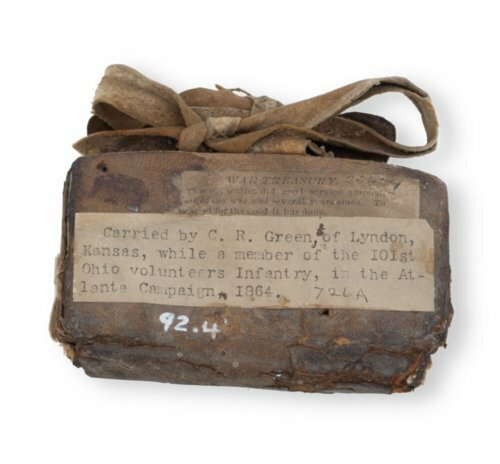 This wallet was carried during the Civil War by Charles R. Green of Lyndon, Kansas, while a soldier with the 101st Ohio Infantry. Green enlisted with the 101st Ohio in 1862. The regiment's major engagements included Stone River, Chickamauga (where Green was wounded several times), and Sherman's March to the Sea. Green mustered out in 1865, came to Kansas, married, and worked as a schoolteacher and farmer.